Homeowners are looking for large, high-tech bathrooms with sleek color palettes and finishes, according to the Houzz 2017 Bathroom Trends Report. “This year’s Bathroom Trends Study sheds light on two key trends in master bathrooms, showers as a focal point and the growing role of high-tech features in bathroom products,” said Houzz Principal Economist Nino Sitchinava. “Still, the early wave of millennial homeowners reveals their preferences for homes of the future, from larger master bathrooms to clean lines and white and gray color pallets,” Sitchinava added. On average, homeowners spent $21,000 to remodel bathrooms exceeding 100 square feet. That cost drops to about $12,300 for homeowners with smaller bathrooms that are less than 100 square feet. 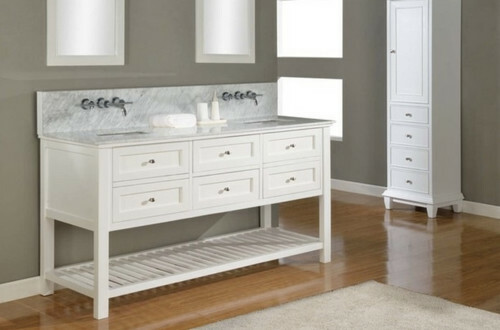 When it comes to age demographics, baby boomers (aged 55+) spent the most on remodeling their bathroom ($13,900-22,800), since the majority of them (58 percent) reported that they don’t plan to sell their home anytime soon. Meanwhile, millennials, who see their home as a short- to medium-term residence, are choosing to invest less in bathroom renovations. Out of the 4 percent of millennials who renovated their bathrooms this year, most spent $9,200 to 12,500. Homeowners of all ages were willing to shell out the extra dough for showers (42 percent), cabinets and vanities (40 percent), faucets (35 percent) and countertops (35 percent). On the other hand, it seems that homeowners weren’t so willing to spend extra money on an upgraded toilet. Beyond updating showers, toilets and faucets, 90 percent of homeowners decided to change the entire style and color scheme of their bathroom during renovations. Contemporary is the most popular style (25 percent), followed by transitional (17 percent) and modern (15 percent). Contemporary is most popular among baby boomers, while Gen-Xers and millennials favor modern styles with clean finishes. When it comes to wall colors and cabinet, countertop and floor finishes, homeowners of all ages favor a white and gray palette over neutral or more colorful options. Although baby boomers and Gen-Xers are more partial to using wood grain and darker tones, Houzz says paying attention to millennial design preferences is important, especially since they’ll be leading the housing market for the foreseeable future. 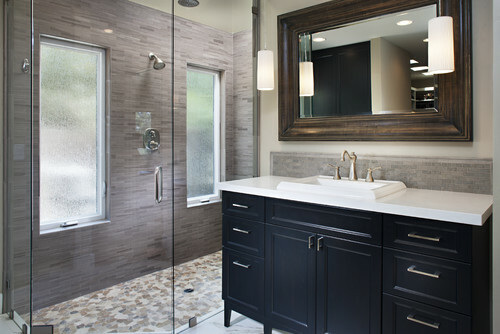 Beyond design and decor, homeowners (27 percent) swapped out bathtubs for large showers, and 73 percent of homeowners chose to add high-end features such as rainfall shower heads (55 percent), dual showers (24 percent), curbless showers (21 percent) and body sprays (18 percent). Also, 29 percent of homeowners purchased a high-tech toilet — a 19 percent year-over-year increase. The most coveted features among toilet techies were self-cleaning (12 percent), optional bidet (8 percent), overflow protection (8 percent) and motion activation (6 percent). The least important features were a self-deodorizer (4 percent) and hands-free flushing (3 percent). Baby boomers also looked for increased accessibility with comfort-height toilets (68 percent). Previous studies have shown that bathroom renovations yield some of the highest ROIs — a report by Zillow showed that blue and periwinkle bathrooms sell for an average of $5,400 more and that buyers tend to favor homes with clean, neutral colors. Houzz conducted an online quantitative survey of registered Houzz users regarding bathroom renovation projects, fielded between June 6 and August 7, 2017.